If you hadn't noticed, I'm having a bit of a moment with Instagram. I'm getting so inspired for makeup looks and enjoying making my feed look all pretty. You can find me @cocoamay_ (or just click here) for plenty of extra makeup pictures, makeup looks, OOTDs and delicious food! 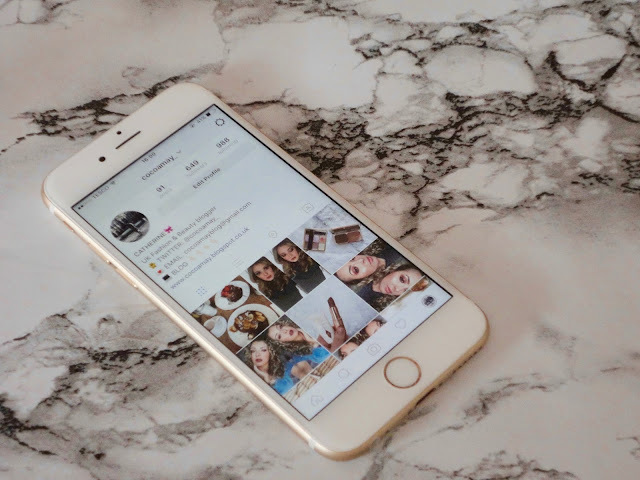 Today, I thought I'd share some of my favourite beauty Instagrammers at the moment. If I'm stuck thinking of a makeup look for that day, I'll just check one of these lovely girls and I'll be inspired! By Brookelle - I've been following Brookelle for a while now, and she is just so beautiful! She is from Australia and she posts the most gorgeous makeup looks. Her preference seems to be bronzy looks (which is perfect because I am the exact same! ), but I also loved her festival inspired looks and cut creases. If you want to see some seriously glowy makeup, check her out! Amys Makeup Box - I've only discovered Amy recently, but I am absolutely obsessed with her makeup looks! I love how she really goes outside of the box by using lots of different colours and I was in love with her recent half cut crease - watch out for my recreation of that! She also has an amazing YouTube channel so you see exactly how to recreate her looks, and her snapchat (AmysMakeupBox) is absolutely hilarious and you get to see lots of sneak peeks of her makeup looks! Makeup With Jah - I literally only found Jah last week but I'm already loving her Instagram! She is a MUA in Australia and both her own makeup looks and client makeup looks are stunning! I'm especially loving the rich brown smoky eye she did on a client last week using ABH shadows - definitely going to be trying that combination out! Stefanie J Watson - Stefanie literally has the most gorgeous brows! Follow for plenty of makeup pictures and plenty of prettiness. I loved this sultry look she posted recently - those lashes are just gorgeous! GRGCTTS - I've been following Georgia for aaaaages, and I'm always amazed by every makeup look she posts! She is a MAC MUA, so expect lots of looks using MAC and everything from simple and glowing, to dramatic and bold, to bright and colourful! Her application is just flawless and I'm always loving her eye combinations. So, now it's your time to share! Who are your fave beauty Instagrammers? Let me know in the comments.